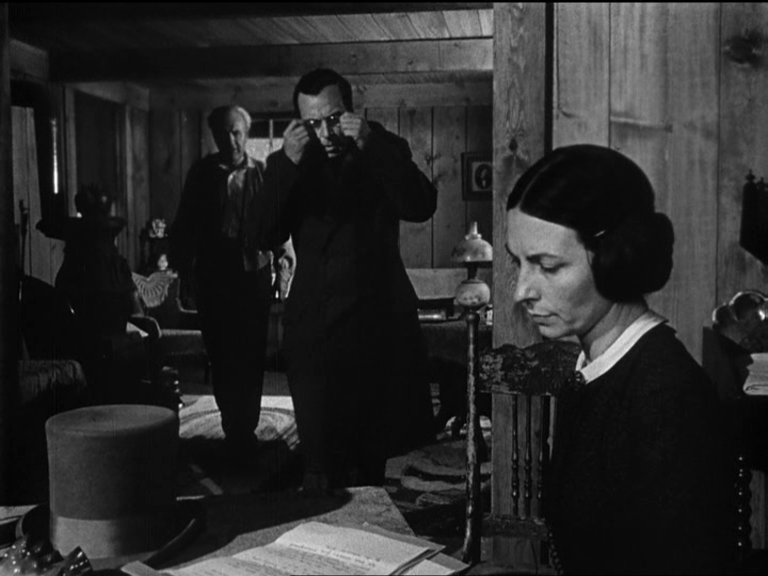 HUSH, HUSH, SWEET CHARLOTTE is a lot of nonsense, and a lot of LES DIABOLIQUES repackaged as southern gothic, but it does keep throwing out stunning images. Bette Davis goes full Bette Davis. Aldrich’s decision not to show the young Charlotte’s face was a very smart one. It others and monsters her from the start, and saves him having to find a young Bette lookalike. And he didn’t repeat the mistake of casting her daughter in hopes that heredity would see him through. It’s a film full of LOOKING. Starring Margot Channing, Melanie Hamilton, Jed Leland, Fanny Minafer, Horace (a leprechaun), Edwin Flagg, Princess Centimillia, Freeman Lowell, Major Max Armbruster, Sweetface and Grandma Walton. 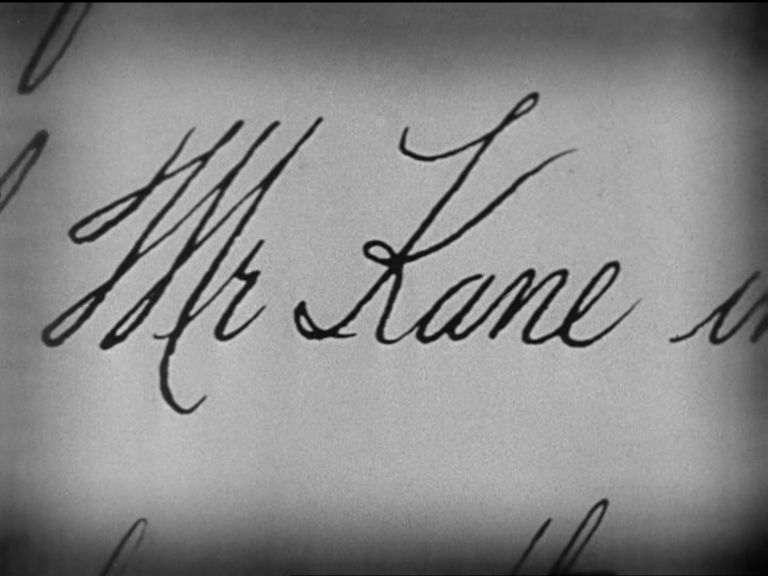 CITIZEN KANE’s first flashback sequence is the one framed by the intrepid Thompson’s visit to the Walter Parks Thatcher Memorial Library, there to peruse the unpublished memoirs of Kane’s garr-DEE-an, as Kane Snr. quaintly pronounces it. It’s interesting, to me anyhow, that KANE started life as a RASHOMON type story in which each person’s memory of the protag/antag would vary wildly according to their opinion of him — and just like in RASHOMON, one account is given by a dead man. 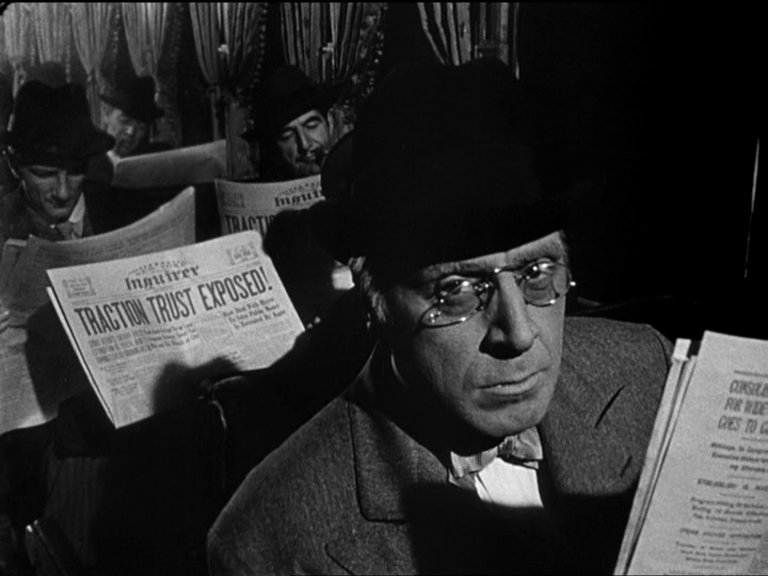 But rather than employing a spirit medium, which might have clashed with the film’s approach and was probably counter to the standard practice of newsreel companies at the time, boy reporter Jerry Thompson goes on the internet consults the memoirs of one who knew Kane well. 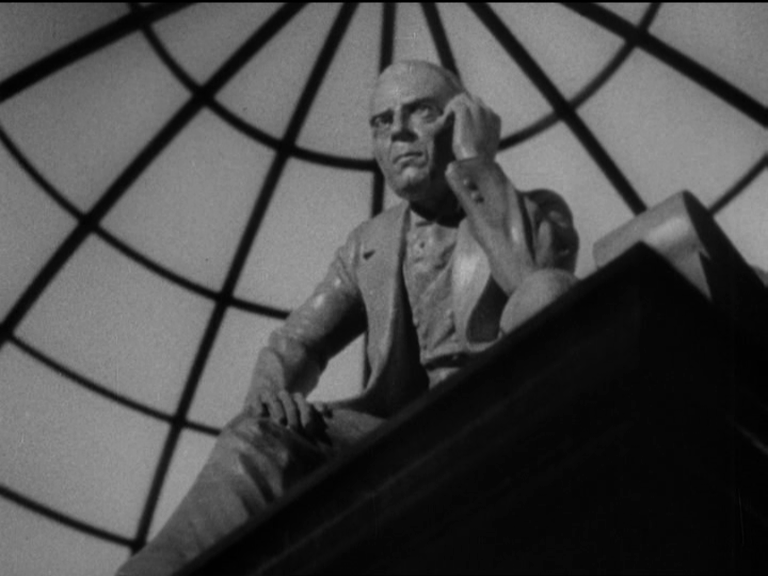 Welles opens, fading in, looking up at a statue of Thatcher, apparently hewn from living butter — but this was not originally how the sequence began. The shot as filmed by Welles started on the plinth and plaque, dollying back to reveal the dragon lady in charge of the establishment and her fruity minion. In post-production, Welles mentioned to FX artist Vernon L. Walker that he’d prefer to start on the statue — just like that, as if it existed. Here we see Welles’ ability to use his naiveté about filmmaking to produce results. Even though what Welles was asking for was impossible, Walker applied himself to the problem — and cracked it. First he shot a stationary low angle on a miniature statue of George Coulouris as Thatcher, whittled from Lurpak by the props department. Then he created an artificial move in the optical printer, scrolling the shot so it vanished from the top of frame. He matched this to a similar move on the plinth and joined the two together with an invisible wipe. Watch the shot in motion — it’s still an astonishing piece of work, and more than makes up for the sloshy skylight at the El Rancho. Let’s pause to consider what a bizarre place the Walter Parks Thatcher Memorial Library is. A library that looks like a mausoleum, guarded by a sniffy librarian and a security guard, The only decorations are a statue of a seated Thatcher, scowling in thought like a bald Rodin, and a humongous painting of Thatcher, scowling at the painter. Behind a heavy door is the reading room, apparently a cinderblock dungeon containing the library’s only book, Thatcher’s unpublished memoirs, which are kept in a vault within the vault. Why are the memoirs unpublished? Because who wants to read the memoirs of a banker? Thatcher no doubt knew this, but constructed a building to house the unwanted book, and employed staff to prevent anybody from reading or quoting from the worthless tome. Thatcher’s library is as grandiose a folly as Kane’s opera house, but at least the theater could serve its purpose and give satisfaction to others. Thatcher’s chilly domain is a monument to himself, and it’s as frigid and pointless as the man who commissioned it. Here’s where no home video rendition of the movie has yet matched what I’ve seen on the screen in 35mm, though it’s been a while and maybe I’m misremembering. But I have a very strong memory of the dissolve to snow being slow and wonderful in a way that it just isn’t on VHS, DVD or Blu-ray. First you see the snowflakes only as they drift across the dark lettering of Thatcher’s prose. Then they grow in strength and you can see them, white on white, as they flutter down the page. Then the page is gone and we’re in wintry Colorado, the land of Mr. Kane’s snowglobe (his own memorial library, of sorts). Bernard Herrmann’s elegiac score actually tells you when you should first see the snow. 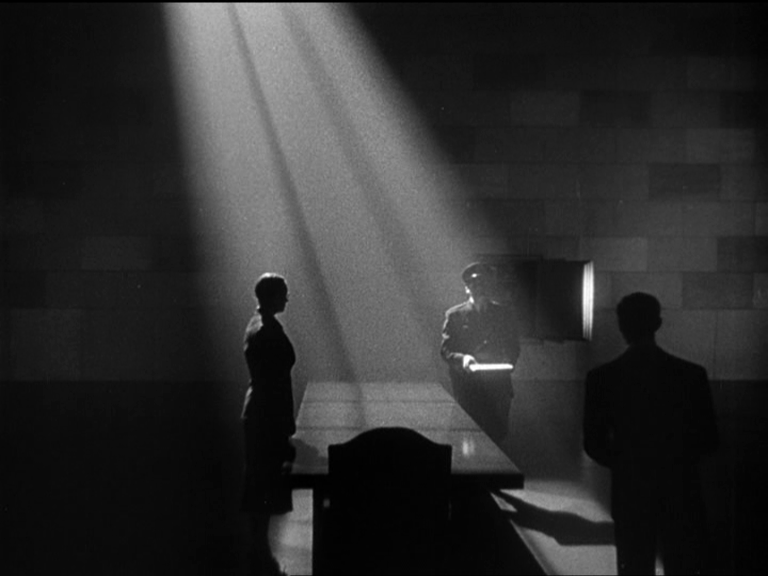 The Blu-ray actually gets this transition wrong more badly than any previous version, fading from diary to snow altogether, then back again, and then back AGAIN, a meaningless fluttering effect that is clearly NOT what was ever intended by Welles, Robert Wise, or anybody else. Dennis Hopper might have done it like that, but not anyone in 1941. It strikes me as an abomination in an otherwise fine disc. 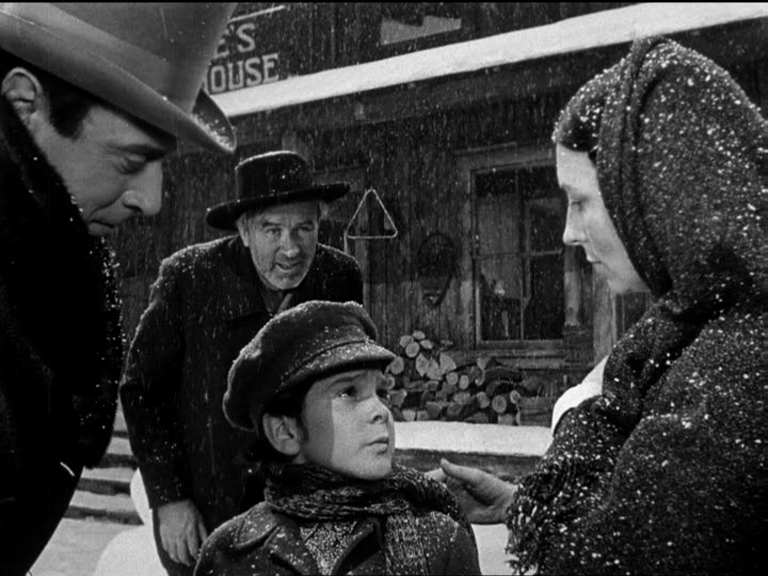 Sonny Bupp (I just like saying the name) sleds about, thoughtfully concealing the MacGuffin with his little torso, then throws a snowball to attract our attention to his home, Mrs Kane’s Boarding House. This leads us to the very fancy long take inside the house, which is actually TWO shots, the view out the window being a rear-projected plate filmed earlier. And this scene features my favourite “mistake” in the film, the wobbling of Thatcher’s hat, known to impudence as a stovepipe. You see, as Toland dollies back, a team of perspiring props men had to slide Mrs Kane’s writing desk into position under the lens, and a chair for her to sit on, thus carrying on the pretense that the camera is a ghostly eye capable of gliding over or even through domestic furniture. The gag works, but the hat resting on the desk gives a little tell-tale wobble. It’s perfectly harmless, not a blight on the movie or anything, but it has a home-made charm to it that’s particularly appealing in this age of CGI and digital technology and Mel Gibson. Agnes Moorehead, in her single scene, is wonderful of course. Fiona says, “I like how she seems in a trance. She’s already made her mind up, so she’s just kind of sleepwalking through it.” The little bits of emotion seeping through Mrs Kane’s businesslike mask add texture to the performance and sow the seeds for the film’s pay-off, which always makes my sister-in-law cry. So much for KANE being a cold film. “It’s BECAUSE it seems cold up until the ending,” says Jane. The young sprog Bupp is a good match for Welles, whose huge head had a kind of baby structure to it anyway, like Harry Earles. That year, he also played in ALL THAT MONEY CAN BUY/THE DEVIL AND DANIEL WEBSTER, and the previous year by some strange quirk he played “Billy Welles” in THREE FACES WEST, featuring John Wayne. Coulouris, the only cast member beside Welles to feature prominently in the newsreel, now gets to stretch his limbs a little — as young Thatcher he has just one scene playing his own biological age, and perfectly conveys the quality of being an old man trapped in a young man’s body. Then we quickly see him middle-aged and then ancient, transformed into Mr. Burns from The Simpsons. And indeed, Coulouris is the only KANE cast member to have aged in line with his Maurice Seiderman makeup. 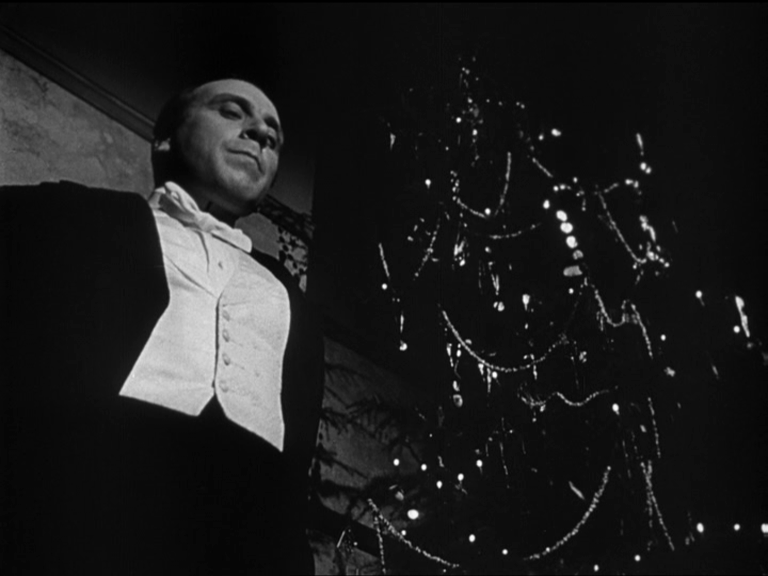 Welles, of course, didn’t become a bald Albert Dekker lookalike with a Frankenstein monster walk. He never even made it into real old age. Nor did Dorothy Comingore, though her fate echoed that of Susan Alexander. But Coulouris in later life always seems exactly like Thatcher in midlife, to sometimes uncanny effect. How can he still be alive, we wonder as we watch him in THE RITZ or THE FINAL PROGRAMME. An exquisite cut — the action of raising the window provides several fine opportunities for a match cut, but Wise wisely chooses the last movement, just as the frame clears shot, affording an unobstructed view of the boarding house front room, which can then become an exterior again as the camera pulls back, The end of this shot is, however, one of the least elegant in the film, an awkward jump in on Bupp and Moorehead which attempts to paste over a visual jolt by cutting in mid-sentence to let the audio glue things together. Pathos — the abandoned sled, bleak pangs of music from Herrmann, the train horn dopplering away into loneliness, thickening layers of snow concealing the MacGuffin. Mr. Thatcher always liked to spend Christmas standing on a camera box. Lovely verbal match from Bupp’s sarcastic “Merry Christmas!” to an older, crustier Thatcher’s “- and a Happy New Year!” as he dictates a letter and the film goes into its epistolary mode, begun with letters and developed with news headlines. Dig the variations in the montage — Coulouris lowering his paper to reveal his face, or his location, a newsboy calling the headline instead of George, as he splutters on lomticks of toast — and finally the reveal of the young Orson, leading into the Big Scene. Thatcher’s final meeting with Kane begins with a sad and creaky parody of his entrance behind a newspaper in the previous scene, as Bernstein lowers the legal agreement whereby Kane is to relinquish control of his media empire, to reveal Thatcher in full preying mantis mode. 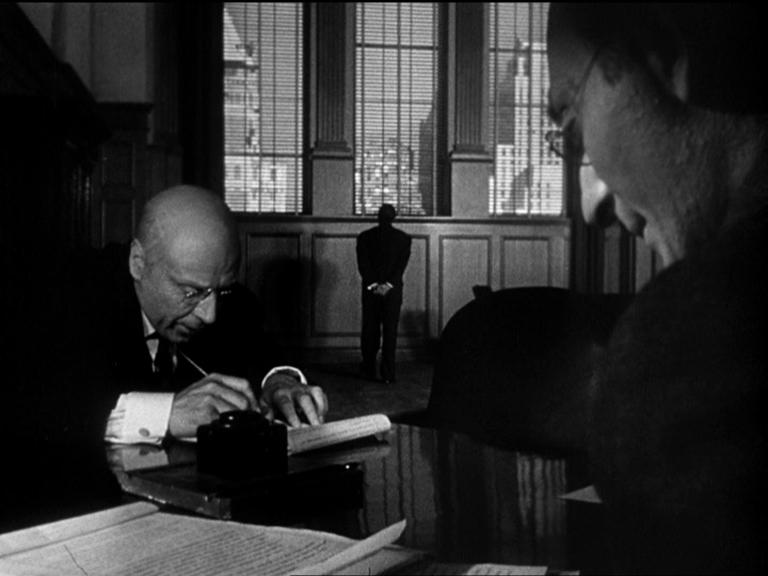 Kane enters from behind Bernstein’s huge, deep-focus head and parades into long-shot as if to measure himself against the skyscrapers at the window. And Thatcher proceeds to play straight man one more time, setting up Kane’s epigrams. “Everything you hate.” — and here we get the key to almost everything. Kane’s every political opinion and every move as a publisher has been simply striking back at the institution that took him away from his mother. And back to the library, for a less abstract and dramatic reverse angle, dominated by an oversized glowering portrait of Thatcher, and we belatedly realize that Jennings the guard is very camp. What with the butch librarian, the Walter Parks Thatcher Memorial Library begins to seem like some kind of LGBT employment scheme. Would the late Wally have approved? Is this some kind of comment on his character? Thatcher seems fairly sexless, but then he’s never allowed to interact with Kane’s dancing-girls or get a minute alone with Jedediah, so no real opportunity for Coulouris to display a steely twinkle in either eye presents itself. Perhaps, in his childhood, if we only knew it, he once possessed a sled with a painting of a cucumber on it, but the movie doesn’t say.